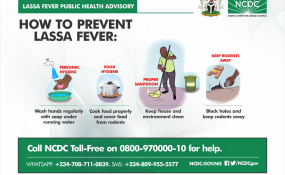 The World Health Organization (WHO) is scaling up response to the Lassa fever outbreaks in states across Nigeria to strengthen rapid containment of the disease. WHO is mobilizing experts to intervene in investigations, contact-tracing, risk communication and plans are underway to strengthen efforts to further assist Nigeria in controlling the Lassa fever outbreak. With the outbreak confirmed, WHO intensified its technical assistance to State and Federal authorities in investigation and response to the outbreak. Dr Peter Clement, the WHO Officer in Charge (OIC) for Nigeria stated that "WHO reorganized its staff to provide assistance to each of the response pillars and directed field offices to assist in outbreak investigation, coordination and response activities at the state level. According to him, "WHO is supporting coordination, enhanced surveillance, contact tracing, and risk communication. We are also mobilizing experts to support case management and detailed epidemiological analysis to monitor situation in the affected states." In Edo State, one of the worst hit states, the Commissioner for Health, Dr David Osifo stated "WHO continues to strengthen capacity of health workers, conduct disease surveillance as well as other control measures which include coordination of contact tracing on behalf of SMOH and engagement with communities".